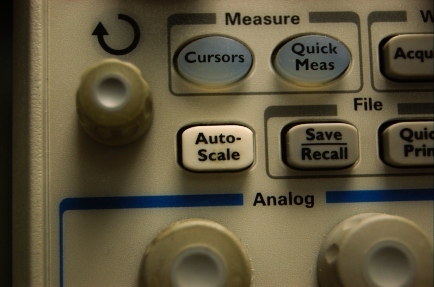 The oscilloscope autoscale button is a perpetual headache for teaching staff in the Senior Design Laboratory. Students often think they have a funny-looking signal, when in reality they’re just amplifying noise and something else is wrong with their circuit or measurement. Why? The autoscale adjustment reports the timebase and channel amplification/scale data in a corner of the display, not through intervention by the operator. Is this bad ID? Or, just poor ID for learners? What mental models do the students have of digital oscilloscopes versus analog ones? Where do we draw the line between automatic and manual in engineering education, between historical and cutting-edge? How important is it to understand a measurement versus knowing how to make a measurement? Should students learn on analog oscilloscopes so they understand the functions of a digital oscilloscope? Should we teach the Smith Chart despite the fact that nobody uses them as calculation tools anymore? Yet, they are one of the most common ways to present impedance information in datasheets and on network analyzers. Engineering is causal. History matters.